The run of the mill office chair is good but they are not perfect. Most of us sit hunched over at our desks to get work done. There has been plenty of research claiming that sitting all day is detrimental to your long-term health – that we are killing our backs in standard office chairs. Probably the reason why standing desks are all the rage in modern offices these days. They encourage you to move around and be just a little more active. 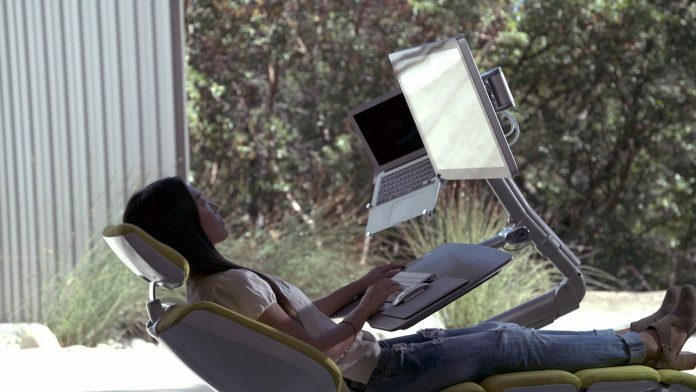 But what about a desk that offers the best of all worlds – it lets you sit, stand, and even lay down while working? Enter Altwork, a totally customizable workstation. Using one of the many preset buttons on a panel built into the desk, you can electronically switch between standing, sitting and a floating reclining ‘focus’ mode that makes you feel like the captain of a spaceship. Just about everything in the station is adjustable: the height of the desk, the height and angle of the monitor, the height of the leg rest, the angle of the seat and the desk etc. Users can program their own four presets that set the chair to a particular height and angle. This could come in handy, for instance, a fully reclined position sounds perfect for media streaming, you would want an upright position for heavy writing work, and two in-between for taking phone calls or reading. Without monitors and laptops, the workstation weighs 210 lbs – with typical monitors, etc., about 250 lbs. The Altwork Station is rated for a 250 pound user, and the company says they are working on moving this number higher. It comes with lockable wheels, so is easy to move around. When it comes to ergonomics, the Altwork Station reigns supreme. However, at $8,500 for the Signature Altwork Station (at the time of this writing), it’s a steep price that only the most affluent computer users can afford. If you’re someone that spends a lot of hours in front of a computer and has the budget, it’s definitely worth looking into. It will be interesting to see what response Altwork gets with this product. I hope that they can offer some of this technology to a wider audience at a lower price point down the line. I’m really interested in this because I have a lot of physical problems. Unfortunately I’m over the weight limit. I’m going to make it my personal goal to buy one of these as a reward for getting down to 250 lbs. Are there color options etc. I think this would be a great showpiece for my office. I’m the IT Director for an Architectural firm & I know we spent a lot of money on motorized desk for our office expansion recently. This might not be that outlandish for an office setting given sufficient space.